Your best bet for a good time in America’s Favorite Playground isn’t the slots; rather, it’s a couple of hundred feet above them in this sweeping helicopter tour. 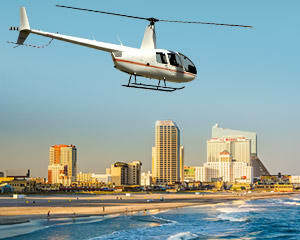 Atlantic City’s world-famous casinos offer stunning architectural scenery when viewed from your thrilling vantage point. Among the fabulous structures waiting to be photographed is the Borgata, the Tropicana, Caesars, Harrah’s and the Trump Tower Taj Mahal!